We spent years having the same conversation, I would ask Scott if he wanted to have another baby and he would say it was up to me. I would think about how wonderful Juliana was and how nice it would be for her to have a baby brother or sister and then I would remember sleeping and spare time and leaving the house alone and date night whenever we wanted…and I would decide to delay the decision a little longer. The week before my birthday in 2008, I told Scott I couldn’t imagine that I was turning 35. He laughed and when he saw the look on my face, he said you are turning 36, not 35. That news made me realize that it was time for a decision and soon after I told Scott I wanted one more. The first month that we tried, I had a feeling very early that I was pregnant. I caught a glimpse of my reflection as I walked past a mirror and I seemed to look different. I took a pregnancy test very early and the line turned pink right away. A week after the pregnancy test, the morning sickness, exhaustion and food aversions kicked in – hard. We went on a family vacation to the Outer Banks when I was 6-weeks and I barely remember that week, I was so miserable. 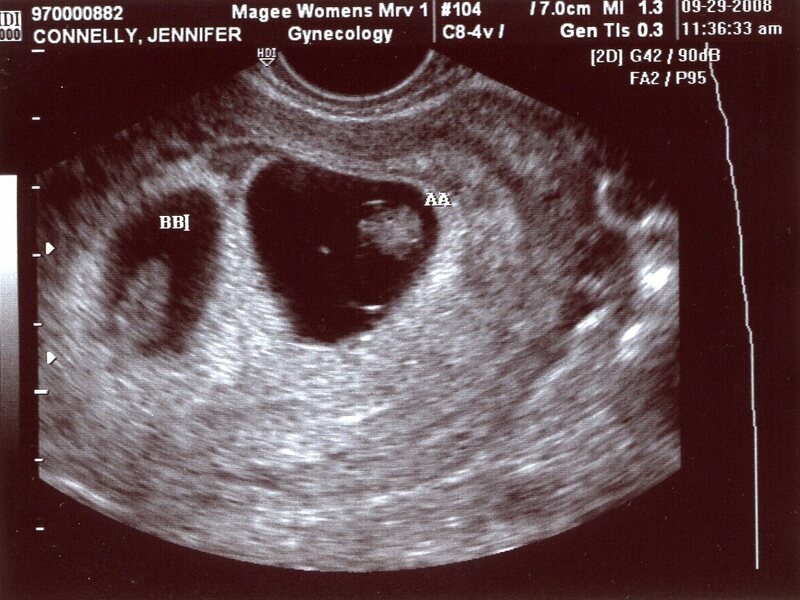 At 7 weeks I had issues and early in the 8th week, they sent me for an Ultrasound to see if the baby was ok and we heard these words, “This is Baby A and this is Baby B, and I see both heartbeats.” Deep sigh of relief that the baby was ok was immediately followed by my life flashing before my eyes – 2? How would we handle 2 babies? The sleep deprivation? We weren’t going to need any baby gear and now we would need another crib and a bigger car. I looked at Scott and he was smiling from ear to ear. He told me that everything would be fine. My Dr appt later that week was filled with information – I would need to stop traveling much sooner this time, I should not expect to make it to my due date (originally the first week of May), I needed to lower my expectations of what I would be able to do towards the end of my pregnancy (plan for the possibility of bedrest, etc). I started anti-nausea medication that week and I needed it for most of the pregnancy. 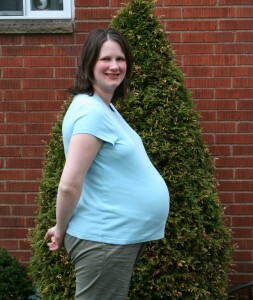 My morning sickness started to subside at week 24 and started back up at week 28. The level of discomfort in those final weeks was very difficult – I kept giving myself target weeks – make it to 28 weeks, make it to 32 weeks and once we hit 34 weeks, I felt like I had done everything I needed to do for my boys. Both boys were breach for the majority of the pregnancy. At 33 weeks, I had an ultrasound and they were both still breach and estimated at just over 5 lbs each already. My c-section was scheduled for 37 weeks. Not only did I make it to my scheduled date, I was able to continue working until the very end. 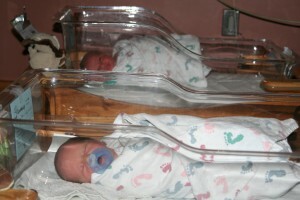 I didn’t want to waste a single day off before they were born. Their delivery was scheduled for 1:30 pm on Monday, April 20th. Since I was not full term, I had an amnio early that morning. 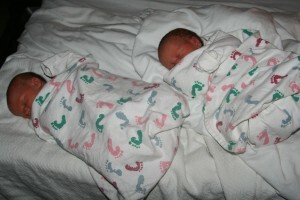 As they were prepping for the amnio, they asked me when the babies had flipped to head down and I was shocked when I looked at the screen – they had been moving a lot recently (causing me lots of pain), but I couldn’t believe that they had both turned. It was still early when we were done with the amnio so we decided to go home and take a nap. Checking into labor and delivery is so different for a scheduled c-section – it was such a calm process. I walked back to the prep area, changed and got my IV and blood work and waited. My Dr came up to see me and expressed his surprise as well that the boys had flipped. A steady line of Drs paraded by to introduce themselves and let me know that they would be observing the delivery. Scheduled c-sections are pushed back based on more immediate needs for the ORs, but we weren’t delayed too much. I walked into the OR at 2:00. The fact that I walked into the OR to have surgery seems so odd. They gave me the spinal and my legs immediately went numb and I started to feel sick (it had been almost 24 hours at this point since I had eaten due to the amnio that morning). Once I was ready, the room filled with people and it was time to deliver the boys. A few minutes later, the boys were proclaimed in perfect health and at least half of the people in the room left. 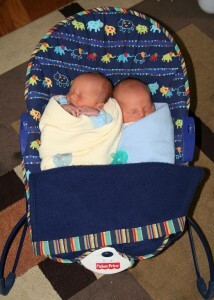 Scott held both the boys while the Drs worked on me. Scott and I had selected their names months before, but we didn’t tell anyone until they were born. When Scott left the OR, he called Juliana’s school and told her that her brothers were here and told her their names. Then he went to the recovery room to wait with our parents. When it was time to move me to the recovery room, they set one baby in each of my arms and I held my boys for the first time. They wheeled me into the room and I introduced the boys to their Grandparents. After a little while Scott’s parents left so they could pick-up Juliana at school and take her home for the night. My parents stayed so they could help us get settled when we moved out of recovery. I started vomiting in the recovery room and that continued for several hours; the medication they gave me wasn’t helping. The spinal was taking a long time to wear off and I could tell that the nurse was starting to get worried. I was in recovery for a while waiting until I could move my legs on my own. Eventually I was moved to the new room and my parents helped us get settled before heading home. The nurse said she could give me some stronger meds that would help my stomach calm down, but it would also make me very tired. It was getting late at this point and sleep sounded like a great idea. The babies went to the nursery for the night and I was able to get some rest. When the nurse wheeled them into the room in the morning, it was so odd to see the two isolettes. Two babies waiting for me. They were here and they were perfect. I was suddenly a mother of boys and we were now a family of five. We looked at them in those first few days and wondered how we would tell them apart. We took pictures and had to look carefully to remember which baby it was. Now I have no trouble telling them apart in those early pictures, I look at this picture from that first morning and have no doubt that Ruslan is the one with his eyes open. My favorite pictures of them from those first few days are the two of them together.